In conjunction with the show, Cherry Hill East Theatre is holding a fundraiser to raise money for hurricane relief. 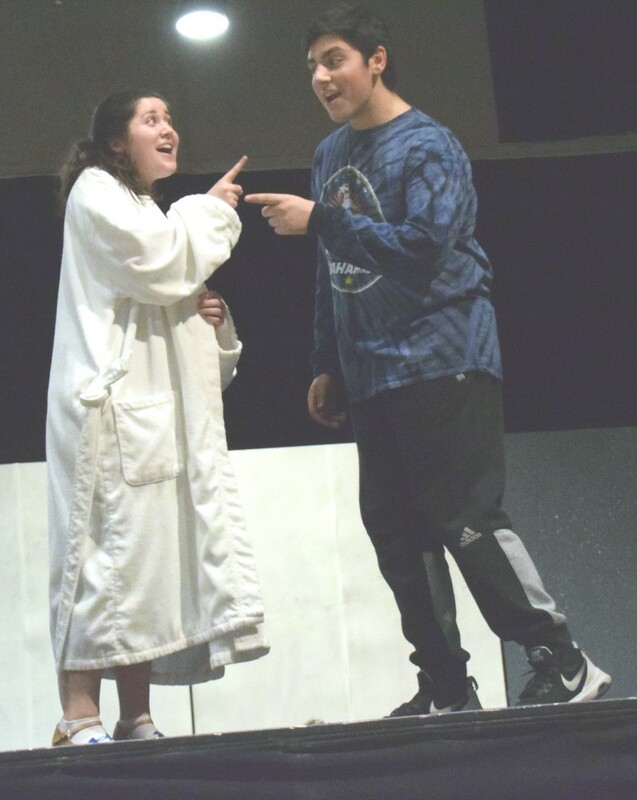 The cast of Cherry Hill High School East’s 2017 fall play, “It’s a Wonderful Life,” is hoping this year’s show has a larger impact than previous fall plays. 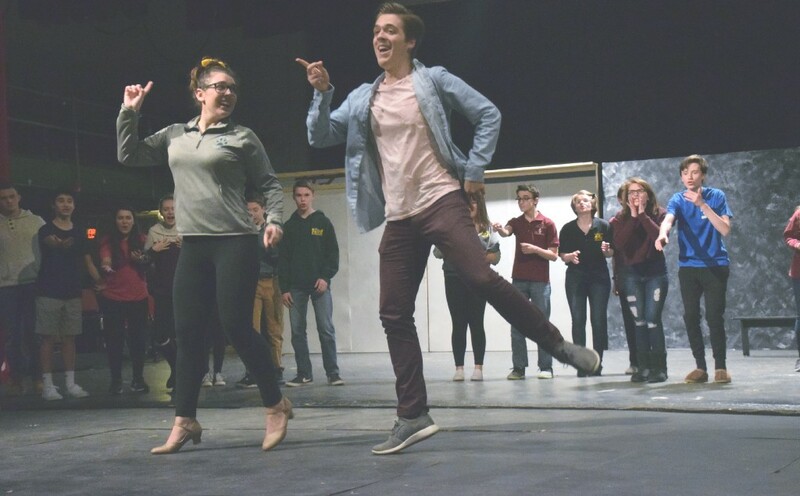 In addition to putting on four performances of the play on Dec. 1, 2, 8 and 9 at 7:30 p.m., Cherry Hill East Theatre will hold a fundraiser for hurricane relief, encouraging the community to give back. The $8,000 goal comes directly from the story of the show. The play is a theatrical adaptation of the popular 1946 film of the same name. In the show, George Bailey becomes depressed and suicidal after his Uncle Billy loses an $8,000 deposit for Bailey’s Building and Loan. Henry Potter, the show’s main protagonist, discovers the lost $8,000 and hides it in hopes of causing issues for Building and Loan. After this series of events, Bailey contemplates suicide, but a guardian angel named Clarence saves him and shows Bailey an alternative reality where he doesn’t exist. Toward the end of the show, Bailey asks for his life back, and upon running home, discovers the town of Bedford Falls had raised enough money to cover the missing $8,000 deposit. The show’s ending was the inspiration behind Cherry Hill East Theatre’s fundraiser. In the weeks leading up to the show, Cherry Hill East Theatre is collecting donations through a Crowdrise campaign. Residents can donate at www.crowdrise.com/o/en/campaign/its-a-wonderful-life-che-fundraiser/kevinnaddeo1. During the show’s performances, guests will have a chance to put in money toward raffle baskets to win a variety of prizes. Cherry Hill East Theatre is partnering with a number of local businesses to have baskets donated. The theater company chose for the money to go directly to hurricane relief efforts, as the group wanted to have a positive impact on people in need outside of Cherry Hill. “We wanted to let as much money as we could count,” said senior Harrison Smith, playing the role of George Bailey in the white cast. The cast’s main goal with the play is to give the audience a good feeling when they leave the auditorium. A number of the cast members have fond memories of watching “It’s a Wonderful Life” with their families and enjoy how the film ends. “It tackles very serious issues such as suicide, depression and what it means to be successful, but it also does it in a heartwarming way,” Smith added. 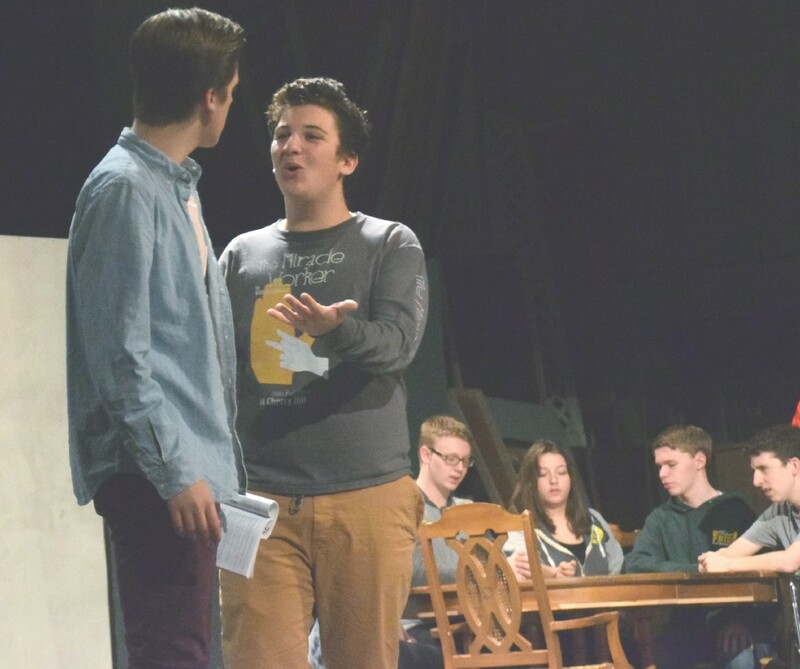 A few cast members, such as junior Jayson Borenstein, hadn’t seen the movie before it was announced to be the high school’s fall play. However, Borenstein said it didn’t take long for him to fall in love with the show. There are a few differences between the movie and the play, but the cast members talked of how they can be a little more creative with how they portray their characters. Borenstein said his version of Potter is a bit different than the one people see in the movie. Jayson Borenstein, playing the role of Henry Potter, gets animated for a scene in the show (left). Harrison Smith, playing the role of George Bailey in the white cast, practices a scene with Jack Granite, playing the role of Uncle Billy (right). 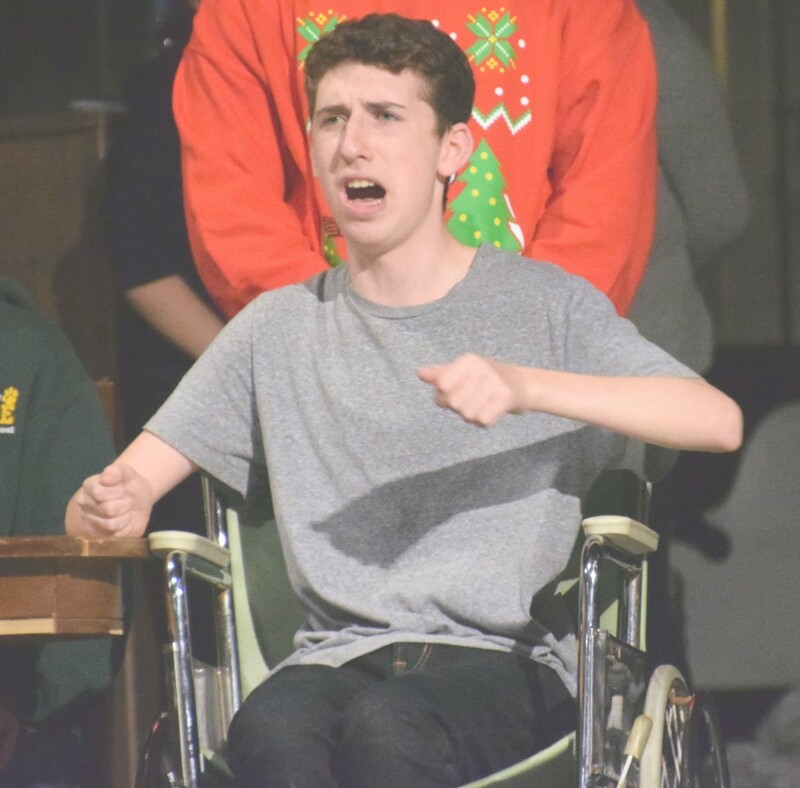 Sophomore Thomas Zieger, playing the role of the guardian angel Clarence in both casts, also put a unique touch on his character. The cast is excited to perform a holiday show and looks forward to bringing smiles to the audience’s faces. Smith believes the community should see the show to get away from the hustle and bustle of the holiday season for a few hours. “The overall idea is that it’s about a community coming together,” Naddeo added. “It’s a Wonderful Life” will take the stage at the Cherry Hill East auditorium on Friday, Dec. 1 and 8 and Saturday, Dec. 2 and 9. All shows are scheduled to begin at 7:30 p.m. There are two casts for the show, with the red cast performing on Friday and the white cast on Saturday. Tickets are $14 per person. Seniors with a gold card can purchase tickets for $5. Tickets can be purchased one hour prior to the start of each show or in advance by calling the Cherry Hill East Theatre box office at (856) 424–2222 ext. 2019.